These are lyrics by Robert Palmer that we think are kind of repetitive. 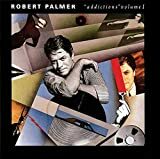 Robert Palmer's, "Addicted to Love"
Robert Palmer's, "The Power-Man Game"
He said 'The power-man game' four times on the chorus. It's just my imagination.